On the fourth leg of the voyage, the Universe Explorer rounded Cape Agulhas, the southernmost point on the African continent where the waters of the Atlantic and Indian Oceans mix, then turned northeast along the coastline of South Africa into the Mozambique Channel. It was a seven-day voyage to Dar es Salaam, Tanzania, with six days of teaching and one day off. The major extracurricular shipboard event on this leg was the so-called Un-Olympics, where teams of faculty, staff and students, each named for a sea, competed in contests from scavenger hunts and world trivia to mashed potato sculpting and synchronized swimming. The faculty, anxious to avoid being dubbed the Dead Sea, adopted the name of a failed lakeside real estate development in southern California—Salton Sea. The team’s motto? Age and treachery will beat out youth and skill every time. Rough weather—a front in the Mozambique Channel—caused the cancellation of a few outdoor events, but everything else went ahead. Salton Sea did not (as many predicted) finish last, despite its quick and ignominious exit from the tug ‘o war contest. It picked up second place in both Improvisation (Stephanie was on the team) and World Trivia (David) and, in a true masterpiece of strategy, won the Male Bikini contest by entering Logan, the two-year-old son of a couple who were teaching geology. This was the first time in 20 years that a SAS ship had docked at Dar es Salaam (in Arabic, place of peace), which most people abbreviate as Dar. The route to port passed several islands and a river estuary, making navigation tricky. Captain Andersson ruled out a nighttime arrival and the ship picked up a pilot early in the morning. The bay was full of small fishing boats, most of them dhows, a reminder of the historic Arab trading influence in East Africa. From the first millennium, Arab merchants, trading between India, Southeast Asia, Africa, and the Middle East, established trading posts along the coast of East Africa. They brought Islam and the Swahili (which means “of the coast”) language, which spread into the interior along the caravan routes. A thousand years before the beginning of the transatlantic slave trade from West Africa, Arab merchants were buying and selling African slaves; spices (including cloves, used in medicine) were the main export, putting local despots like the Sultan of Zanzibar on the Fortune 500 list of richest men in the world for the 17th century. The sultan might still be enjoying the benefits of a more diversified portfolio today, if it had not been for the British who led the anti-slavery crusade and then grabbed a large chunk of East Africa, resources and all, for the empire. Britain and Germany, which was playing colonial catch-up, then carved up the region into spheres of influence—the British in present-day Kenya and Uganda, the Germans in Tanganyika and Zanzibar. The colonial era brought roads, railroads, public health, education and cash crops, including tea, coffee and sisal, used for making rope and baskets. Defeat in World War One ended German political influence, and Tanganyika and Zanzibar were ceded to Britain under a League of Nations mandate. Colonial geopolitics meant little to the people of the region, most of whom lived in rural areas. The boundary between Kenya and Tanganyika was illusory for the Maasai, who grazed their cattle herds across vast stretches of grassland. From time to time, German census-takers would show up and attempt to count them. The Maasai reckoned, probably correctly, that if they and their cattle were counted they would also be taxed, so they disappeared into the bush until the officials gave up and headed back to Dar. Tanzania—the combined state of Tanganyika and Zanzibar—became independent in 1971, and for the next decade and a half experimented with socialism under its first leader, Julius Nyerere, whose political ideology was an eclectic mix of Marxism and Christianity. Nyerere, regarded as a leader of the pan-African movement, was more successful on the world stage than at home, where central control throttled growth, and state enterprises were robbed by their managers. Nyerere kept to his principles—TV was not introduced until 1976 because he feared it would widen the gap between rich and poor—but his socialist state deteriorated into a one-party, authoritarian regime. After Nyerere left office in 1985, successive governments privatized most state enterprises and liberalized the economy. Yet Tanzania remains one of the poorest countries in the world, with most of its population dependent on subsistence farming. With almost 170 tribes or ethnic groups, nation-building is a huge challenge. In 1973, in a bid to unite the country, Tanzania moved its capital from Dar on the coast to Dodoma (population 700,000) in the middle of the country. 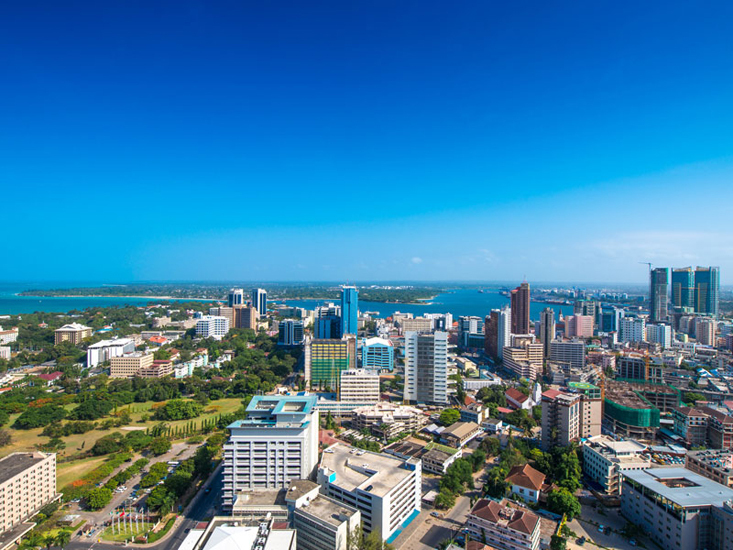 Dar is Tanzania’s main commercial center, a bustling port city, with a population of over four million. Ethnically, it’s the most diverse city in the country, with Arabs, Indians, Pakistanis and some Europeans prominent in the commercial sector. It has a predictable downtown skyline, with some high-rises, but most of this sprawling, noisy, colorful city is distinctly low-rise—markets, roadsides lined with stores, bars, restaurants, auto repair shops, and small lumber yards turning out household furniture and, ominously in a country with a relatively high percentage of HIV/AIDS victims, coffins. Most houses in Dar were block with tin roofs, but after we left the outskirts of the city modern building materials were replaced by mud bricks and straw, with roofs thatched from coconut leaves. Except for commercial businesses, few houses had electricity or running water. We passed through a string of small villages, each with a store, a bar and a beauty salon, often decorated with hand-painted images of African-American cult heroes (Muhammad Ali, Michael Jordan). The small towns had truckers’ hotels, guest-houses and bars, boasting exotic names such as the Camp David Resort and the Manchester Executive Bar.